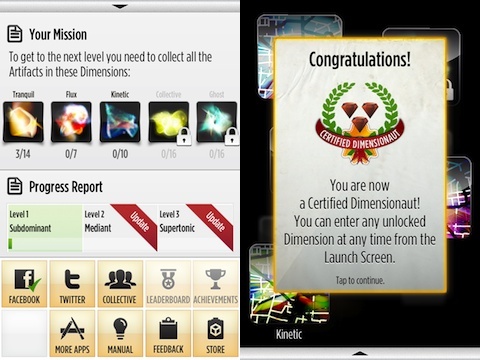 The Dimensions – Adventures in the Multiverse application is a novel idea even in the world of iPhone app functionality. It is an experience in which sounds from your everyday surroundings are pulled into the levels to create soundscapes that you must explore in a Pac-Man like way, collecting dots known as Artifacts and avoiding ghosts known as Nephalims. However, Dimensions – Adventures in the Multiverse is realms away from Pac-Man, drawing new levels and dimensions from the surrounding environment for endless replay possibilities and employing some of the best music ever heard in a gaming application. The concept for Dimensions – Adventures in the Multiverse of passive gaming is not a new one, but it is the first time that it has been developed to such a degree. It has been praised as one of the best developed games for the mobile platforms, and the maker of the game RjDj, promises that the five dimensions that you can now explore will be soon expanded for even further gameplay. Even though you must pay for the app itself and also purchase “ammo” for your “gun,” it is worth it. The concept is the best developed of its genre and expanded gameplay promises the investment will well be worth it. The controls in Dimensions – Adventures in the Multiverse are a thing of beauty. Everything that you have to do is quite intuitive, and new players will quickly pick up on the basic controls. Even so, Dimensions takes a while to master, so you will not lack for challenge. The audio in Dimensions – Adventures in the Multiverse is some of the best music in mobile gaming today, not surprising because the maker of the app comes from the music industry. RjDj say that they will always remain musicians; however, the music industry is simply not the best way to introduce the world to music these days. With many other bands going the gaming route and video gaming music being hailed as the new classical, he probably has a point. Graphics for Dimensions – Adventures in the Multiverse are probably the only weak point in the entire experience, and the audio and the concept more than make up for it. It is meant to be a sort of ethereal world that fades in and out, which almost necessitates the use of hazy, less profound graphics. Let’s just say that the graphics fit the concept, but if you are looking at it purely graphically, it is nothing to write home about. With new dimensions being programmed as I type this, the value of Dimensions – Adventures in the Multiverse will only grow with time; it remains a good investment both now and in the future. There are also multiplayer options which change with your friend profiles, so as your friends change, so does your playing experience. Overall, Dimensions – Adventures in the Multiverse is one of the best games that I have played recently for the mobile platforms. Others are catching on to this concept, and this game somehow still remains light years ahead of the competition. If you are looking for top notch gaming, Dimensions – Adventures in the Multiverse is exactly where you need to be. 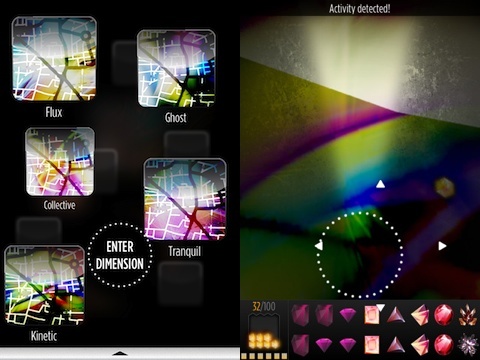 AppSafari review of Dimensions – Adventures in the Multiverse was written by Joe Seifi on December 13th, 2011 and categorized under App Store, Fun, Music. Page viewed 5345 times, 1 so far today. Need help on using these apps? Please read the Help Page.